A very popular window – and for good reason. Awning windows push out effortlessly from the botoom and give ventilation with a measure of preotection from unexpected passing showers. 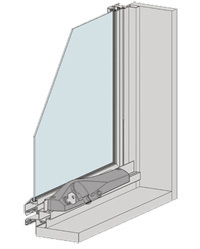 When closed, awning windows offer excellent resistance against air and moisture penetration. Series 516 Awning windows deliver 450Pa water resistance (suitable for Darwin) and have a narrow 50mm frame. Successfully tested to comply with Australian Standard AS 2047. Optional mullion strengths cover a large variety of design wind load areas. Water resistance rating of 450Pa allows this awning window to be used in most exposed residential locations in Australia. Awning type sashes are fitted with heavy duty chain winders. Our manual chain winder is illustrated on the back page along with the relevant features. Casement type sash option available. These sashes are fitted with stainless steel friction stays and wedgeless cam handles. Fixed sidelights and lowlights can be supplied with optional self draining ball valve that drains condensation water back to the outside while preventing blow backs through the drainage hole. Optional 20mm insulating glass available. Moulded nylon sash corner guards designed to protect the exposed lower corners when the awning sash is in the open position. Custom co-extruded Santoprene bulb seal for maximum weather performance.